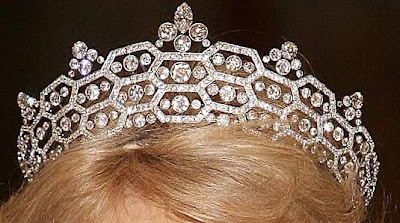 The Greville Tiara, also often known as the Boucheron Honeycomb Tiara, was part of the Greville bequest to Queen Elizabeth, the future Queen Mother. The top of the tiara was altered by the Queen Mum, who counted this among the two tiaras she wore in her later years. It passed to the Queen in 2002. She never wore it, but loaned it to the Duchess of Cornwall following her 2005 wedding to the Prince of Wales. It has become the Duchess' most-worn tiara. Read more at Order of Splendor.